This kit has the tools to conquer any precision cut. From fading, to trend haircuts, to beards, and more. This all-in-one set is designed to enhance every haircut, filling in hairlines, defining edges, and refreshing color instantly. 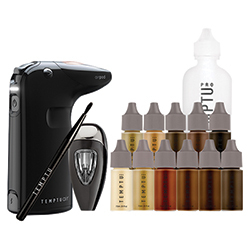 Includes the award-winning, cordless TEMPTU Air and Patented Airpod System, Men's Grooming Stencil, and eleven shades of Root Touch-Up and Hair Color. Groom and shape hair with the Men's Grooming Stencil, featuring four shapes to choose from: Straight Edge, Sideburn Curve, Free Shaper, and Jawline/Beard. The Root Touch-Up and Hair Color formula is long-wear, transfer-resistant, water-resistant, vitamin-enriched temporary color. Includes: TEMPTU Air, Airpod Pro Cartridge, Men's Grooming Stencil, S/B Cleaner (4 oz. ), Root Touch-Up and Hair Color (1/4 oz. bottles in Auburn, Light Brown, Medium Brown, Dark Brown, Black/Brown, Platinum Blonde, Golden Blonde, Ash Blonde, Sandy Brown, Ash Brown, Chestnut).